Spinach, a rich source of vitamins, minerals, pigments and phytonutrients, is a leafy green vegetable. Due to its inexpensiveness and high nutritional values, it becomes an obvious option for everyone’s meals which leads you to prescribe by doctors and nutritionists to consume in your regular diet. So overall spinach is a complete food that has the health benefits like neurological benefits, anti-cancerous benefits, healthy fetal development, heart attacks, anti-ulcerative, healthy blood pressure, include improved eyesight, cataracts, stronger muscles, bone mineralization, skin protection, prevention of age-related macular degeneration, boosted growth for infants and atherosclerosis. It is a rich source of vitamins like vitamin A, vitamin B6, vitamin C, folate, and niacin, along with some other vital elements include thiamine and riboflavin with a rich source of pigments. It also constitutes potassium, manganese, zinc, magnesium, iron and calcium to make it a complete diet. The ratio between high and low percentages of Potassium and Sodium maintains the balance the range of blood pressure. The folate is responsible for proper blood circulation in the body. The regular consumption of spinach helps you to make your neurological system. As per the studies, spinach benefits in Alzheimer’s disease a lot. The health of brain and blood flow towards brain are completely controlled by the usage of Potassium. Spinach is solely responsible for strengthening the muscular system of human body. Due to the proper quantity of spinach in your diet, you can stay away with many cardiovascular diseases like hypertension heart failure, hyperlipidemia, and coronary heart disease. Spinach is quite beneficial in the treatment of various kinds of cancer like bladder, prostate, liver and lung cancers. 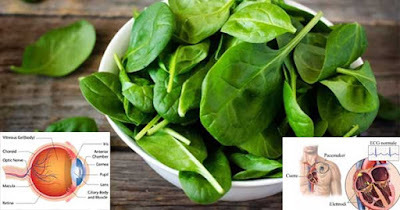 Different components of spinach like folate, tocopherol, and chlorophyllin performs in different mechanisms to treat and protect patients suffering from various types of cancer. The protein found in spinach can be broken down by the enzymes into amino acids that are essential to humans which directly aid our muscle development and growth, our body’s ability to heal the wounds, and provides enhancement for our entire metabolism.